This City Knows How to Celebrate Public Works Week! Public Works employees treat our water, take care of our sewage, haul our garbage, and clean our streets. They do some of most important (and often most thankless) jobs in our cities. Although they don’t receive the thanks they deserve each day for keeping our towns running smoothly, they DO get one week in May each year when they’re in the spotlight. How does your city celebrate National Public Works Week? 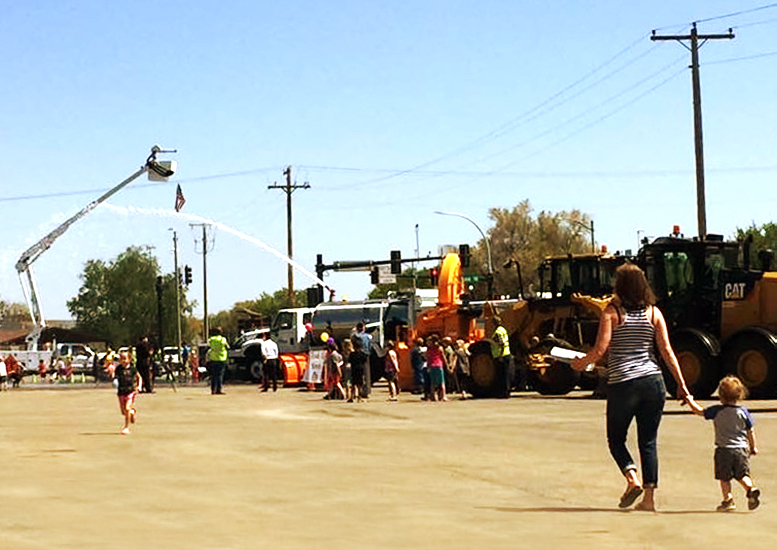 The Public Works and Engineering department for the City of Williston, North Dakota, hosts an awesome annual event to educate residents about the services they provide. Williston invites the public to an open house celebration to meet their public works employees and check out some of their cool equipment. Public Works also uses the annual event as an opportunity to share information about current or upcoming projects. The families and school children who attend the event each year seem to particularly enjoy seeing the wheel loader, snow plow, firetruck, ambulance, garbage truck, and other heavy equipment up close and watching demonstrations of how everything works. Williston typically holds the celebration in the parking lot of the local community center. In advance of the event, the City of Williston sends out a news release to local media who in turn publishes information about the event. The City of Williston also promotes the Public Works Day celebration on social media in advance of the open house. On event day and in the following days they post photos on social media to give their followers a look at all the fun. Educates the public about the many important services the City provides. Allows residents to meet the people who clear the snow off their streets and fill potholes. Demonstrates how the City’s heavy equipment works. Draws attention to important public works projects that were recently completed, actively happening, or on the horizon. Gives public works staff a pat on the back for a job well done. Creates a fun event that families and school children look forward to each year. Provides a ton of social media opportunities before, during, and after the event through graphics, videos, photos, and even Facebook Live. Take a page out of Williston’s book and invite the community to meet your staff and check out your City’s equipment. It could become one of the highlights of the year in your town. If you’re interested in additional ways to celebrate Public Works, Infrastructure, or Drinking Water Weeks, check out these social media suggestions. PreviousIt’s May! Let’s Celebrate Drinking Water, Infrastructure & Public Works!